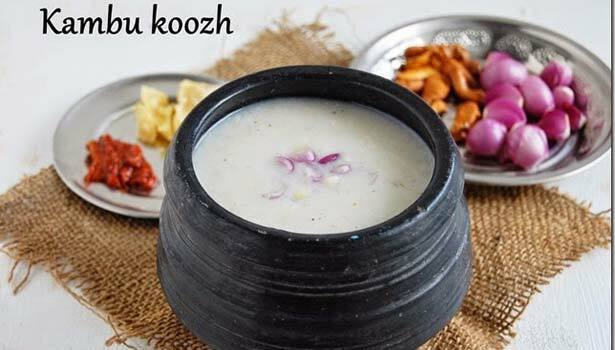 Kambukoozh is an ancient Vegetarian recipe, a drink mentioned in Sangam literature as healthy traditional breakfast or lunch. A rich in fiber, high in iron, calcium and vitamin B- Complex packed semi-solid porridge, filled with essential nutrients, proteins can give a sour tang flavor if fermented and consumed by adding water, buttermilk, onion, curry leaves, and coriander leaves served with side dishes like green chilies, pickles, spiced mango or dry fish gravy. The microbes present in the cool demonstrated to be probiotic in nature, such micro-organisms provide health benefits when consumed.